I recently discovered that you could use iron on transfer paper on felt + clip art to make the cutest felt sets ever. I kept thinking I would make some sets by hand for my girls or use my Silhouette machine to cut out some felt, but just never got around to it because it seemed too overwhelming to craft it by hand. I made some sets this summer for Vacation Bible School but they are time consuming and not as cute as the clip art version. 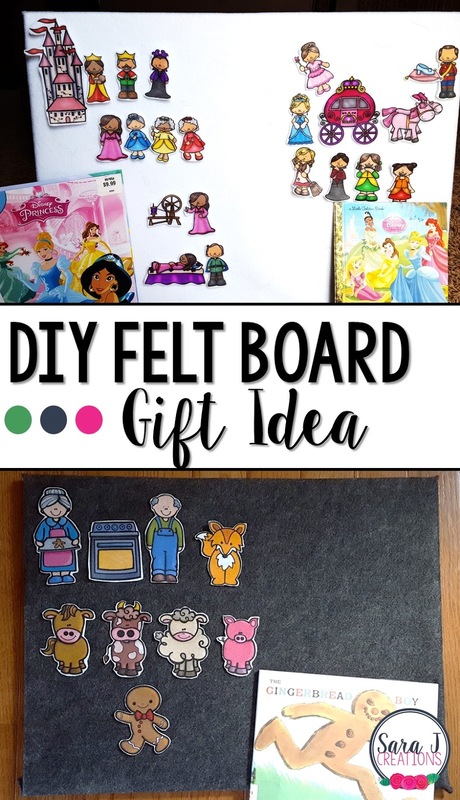 Now that I know how easy it is to make a DIY felt board and felt sets, this will be my new go to gift for the preschoolers in our lives. It is so easy to make, let me show you how! The felt board is relatively easy to make. It takes some measuring, cutting and stapling and then it is ready to go. I made my girls a white one and a dark gray one so we can use a different one depending on the project. Cut the felt so that it fits on the frame with about one inch hanging over on all sides. Lay the felt down flat and the canvas face down on top of it. Wrap the felt and staple all around the board. Fold the extra material or cut the excess at the corners and staple. Make sure to pull the fabric as you staple so that it will be flat and tight when you flip it over. I initially got this idea from Jen at Teaching in the Tongass on her Instagram account. She has a quick video tutorial in her TpT store for free if you want to check that out. Once you've downloaded the clip art to your computer, open PowerPoint. Go to File > Insert Picture and insert the chosen clipart. Adjust it to the size of your choice. Follow the directions on the iron on transfer paper package. Basically you run it through your printer (adjust your paper type to Iron On Transfer Paper) just like a normal piece of paper. Because I was doing three sets at once this time, I took the lazy route and flipped the whole page over and ironed it. You waste more felt this way but it was faster than cutting out each piece, then ironing it, then cutting it out again. Press hard with the iron (no steam and no ironing board) and again, follow the directions on the package. Once it is cool, peel off the paper backing. Cut around each piece of clip art. Stick each piece to the felt board. This is what it looked like after I ironed the sheets on and removed the paper backing. All that was left was cutting. This DIY would make such a cute gift for the young children in your life. It is great for helping children practice retelling a story. To make a cute gift, simply make a felt board and a few felt sets and you are ready to go. Bonus points if you can find books to pair with the clip art, so the child can read the story and then reenact it on the felt board. I made a gingerbread version for my girls as we were reading different versions of the story. I also used my Cinderella and Sleeping Beauty clip art from Educlips to create a princess version to pair with the movies and books that we own. And perfect for this time of year, a nativity set to pair with some of the Christmas stories that we've been reading. There are so many clip art possibilities out there that matching clip art and books should be easy - think movies, nursery rhymes, Bible stories, fairy tales, etc. You can even do non fiction text and make felt pieces for different animals or science topics, historical sets, etc.